Kashmiri Red chilly powder 1 tsp. Tandoori chicken masala 2 tbsp. Prepare marinade with the marination ingredients above. Marinate the chicken in the marinade masala,preferably overnight or atleast for 3 hours,in the fridge. Pre heat the oven for 350 C.
Now drain off the excess water and the oil that comes out of the baking chicken in the tray and turns the chicken pieces and bake them on this side for another 10-15 mins. Again drain off any excess water and oil,turn the chicken and baked for 10 mins for the red colour. Remove the tray from the oven and serve with hot. 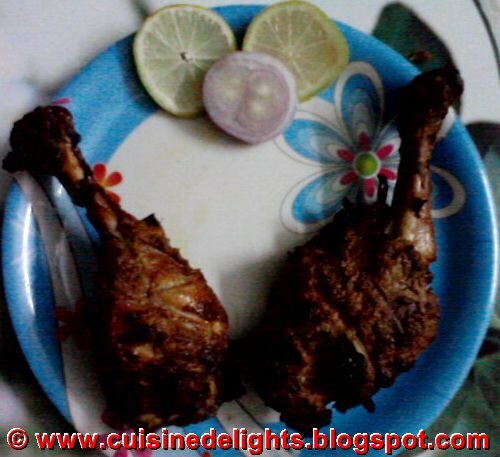 Tandoori chicken serve with salad, slices of onion and lemon.